The rise of populism in new democracies, especially in Latin America, has brought renewed urgency to the question of how liberal democracy deals with issues of poverty and inequality. Citizens who feel that democracy failed to improve their economic condition are often vulnerable to the appeal of political leaders with authoritarian tendencies. To counteract this trend, liberal democracies must establish policies that will reduce socioeconomic disparities without violating liberal principles, interfering with economic growth, or ignoring the consensus of the people. Poverty, Inequality, and Democracy addresses the complicated philosophical and moral issues surrounding the distribution of economic goods in free societies as well as the empirical relationships between democratization and trends in poverty and inequality. This volume also discusses the variety of welfare-state policies that have been adopted in different regions of the world. The book’s distinguished group of contributors provides a succinct synthesis of the scholarship on this topic. They address such broad issues as whether democracy promotes inequality, the socioeconomic factors that drive democratic failure, and the basic choices that societies must make as they decide how to deal with inequality. Chapters focus on particular regions or countries, examining how problems of poverty and inequality have been handled (or mishandled) by newer democracies in Latin America, Eastern Europe, Africa, and Asia. 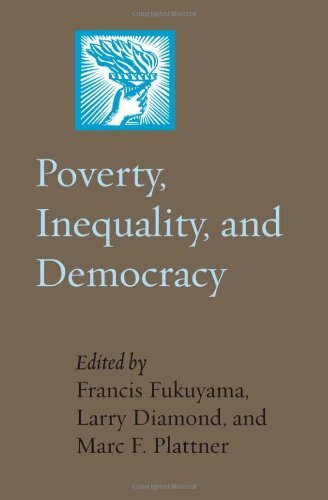 Poverty, Inequality, and Democracy will prove vital reading for all students of world politics, political economy, and democracy’s global prospects. Francis Fukuyama is the Olivier Nomellini Senior Fellow at Stanford University’s Center on Democracy, Development, and the Rule of Law.